So the race for the Presidency is really gearing up. Without getting political about it, I took a look at the candidates’ websites. Which websites — in my opinion — are the most appealing and effective? Which candidate got my vote for best website? I took a look at the election websites of President Obama, Michelle Bachmann, Mitt Romney, Rick Perry, Newt Gingrich, and John Huntsman. These are the criteria I used…everything is judged by the home pages you get to after the sign-up landing page most candidates use, and the appearance of the website home page “above the fold” or what you tend to see of the website on a desktop computer without having to scroll down. 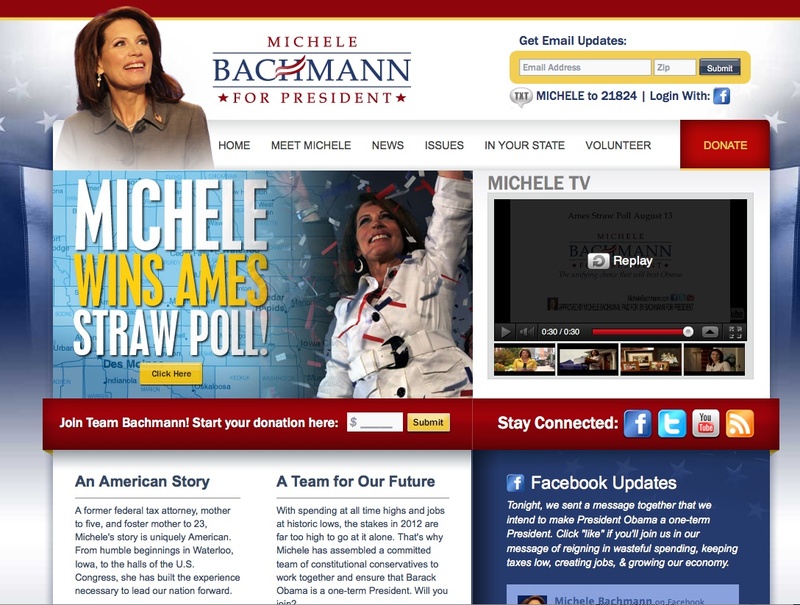 Michelle Bachmann, hands down, has the most visually attractive and best designed website of the group. 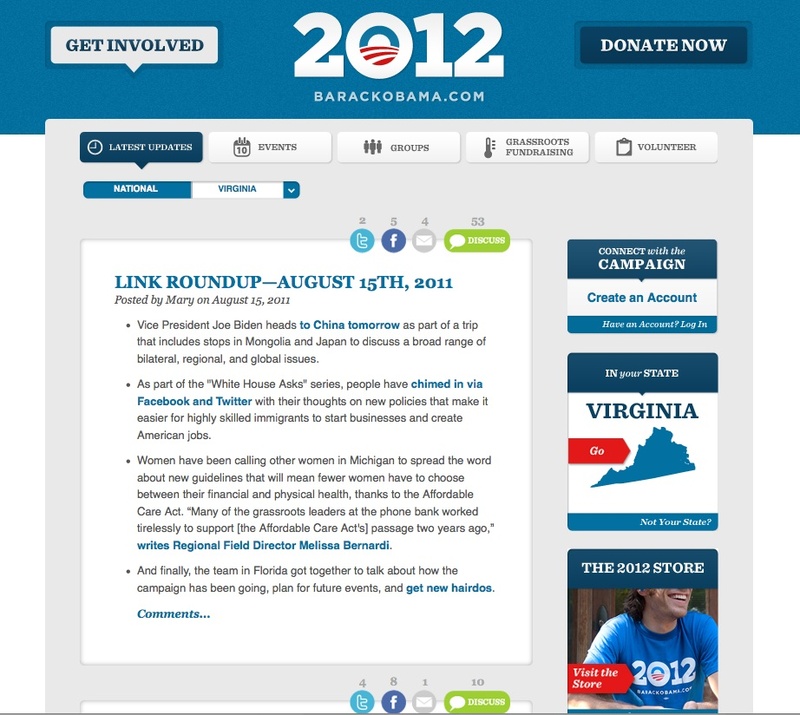 The Obama team has a lot of work to do (I think they should have come up with a fresh new graphic for 2012, but that is the least of the website’s issues), and Jon Huntsman’s website is clearly the worst appearing. Newt Gingrich has the best campaign graphic of the bunch, and the website really isn’t bad at all, but it’s awful heavy on the “all-caps” which makes it appear a bit aggressive (which may have been intentional). Mitt Romney’s website doesn’t do much for me except for the iconic navigation, which is truly well-designed and functional. 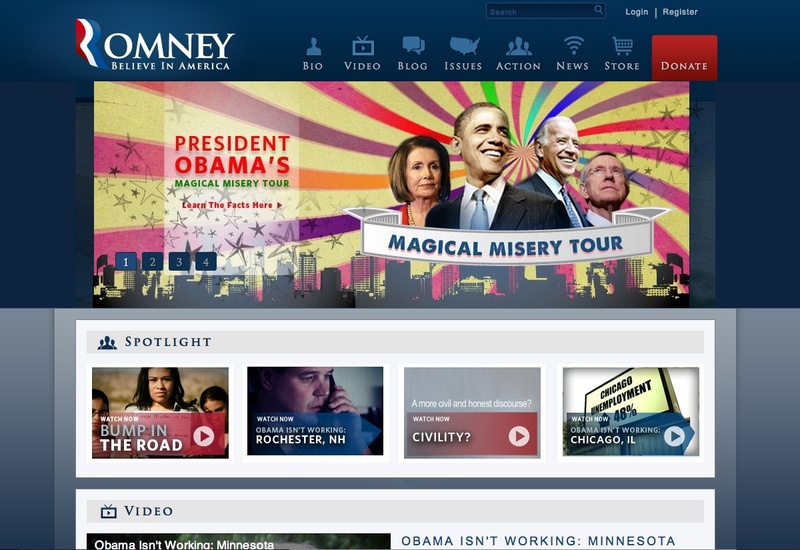 However, it is more eye-catching than the Obama website. All of them are, except the truly lame Huntsman site. The design misfired. I believe the intent was to make Obama make ridiculous, but the graphics actually make him look pretty cool! Sigh. Listen, I told you this was not about politics. I have to call it as I see it. In my opinion, a political candidacy website has to have viewable video, preferably YouTube video, on the front home page, above the fold. Obama 2012 and Huntsman missed the boat on this. Completely. Michelle Bachmann, once again, rocked it with the absolute best use of video on the home page of all the major candidates. Perry comes in at a distant second because the video is right in the fold and is so small. Both Romney and Gingrich opted for large images that link to videos played on another page. That’s okay…but I really like that video player right on the home page. Michelle Bachmann took this category by a landslide. Say what you will about the Tea Party but they really do get social media. The other candidates don’t even rate, except, again for Newt Gingrich. To find any Obama social media links you have to scroll way down. Not good! Romney, Huntsman, and Perry didn’t have them above the fold, either. Not a swift move, dudes: don’t discount Facebook and Twitter in this race! The Obama team has become WAY too complacent. This blog-style website doesn’t have the punch it needs to win. I am really dismayed by the lack of emotional impact of the Obama 2012 home page. There is no message or image of Obama. The website must present the candidate and the essence of the key message right up front. Epic fail in that department. Huntsman’s site is only marginally better. 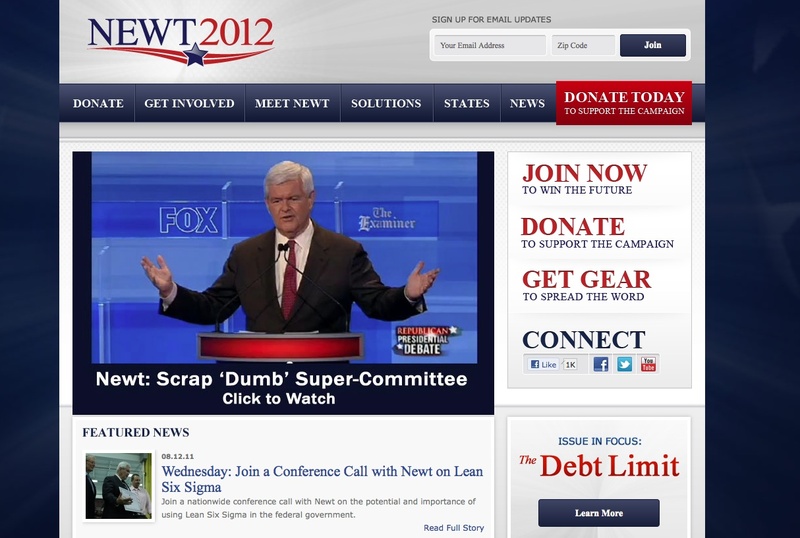 When you visit Newt Gingrich’s site, you know it is Newt, but there is no real compelling candidate message. Romney has one, but it’s so negative. Tell us what you are for, not just what you are against. Rick Perry’s and Michelle Bachmann’s are so much better in this regard, it’s not even funny. Both manage to present appealing and emotional images of the candidates and their positions. The website copy, photos, images, and design work well together to draw you in and motivate you to read more. The race for this aspect is pretty darn close, but maybe Perry has the slight lead over Bachmann. 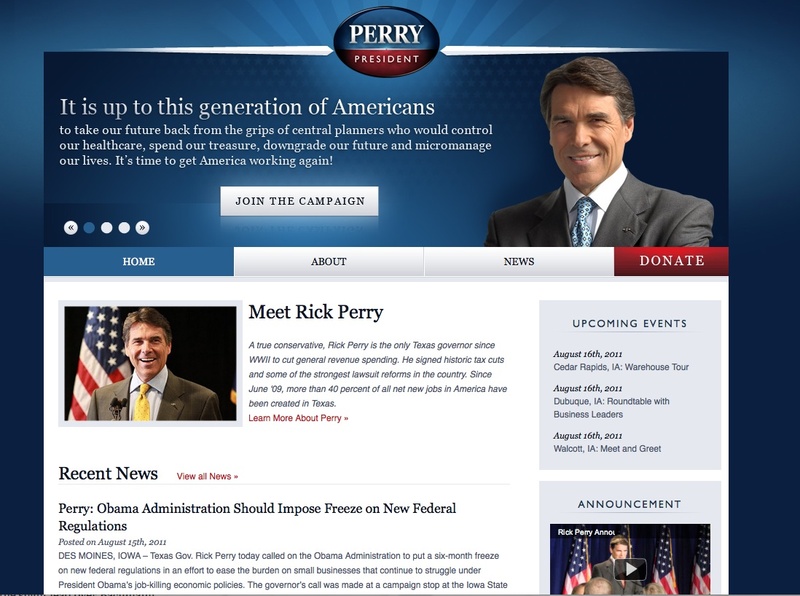 Rick Perry combines appealing design, images, and attention-getting copy to elicit emotion and motivate you to read more. Michelle Bachmann is the clear winner when it comes to Presidential election websites. I would say Rick Perry comes in second. Newt Gingrich comes in third. Mitt Romney comes in fourth. President Obama comes in second to last. Try harder! Much harder! John Huntsman comes in last and is barely a contender. Part of what I do at Fletcher Prince is create affordable websites for clients. I also build them for my own projects. I use website solutions marketed to small business owners, so I can focus on the content and design. You know, often I find simple is better. Most businesses and nonprofits I work with need a website that does the job, looks attractive, is easy to update, and gets found in search engine results. In my experience, no other website content management and hosting system does that better than Yahoo Small Business. I have experimented with the offerings from Yahoo Small Business, Network Solutions, and Verizon Small Business, as well as WordPress.com and WordPress.org (for blog-style websites with Page navigation). Hands down, the best solution I have tested is Yahoo Small Business. It works well with Macs, it offers terrific SEO, and is quite affordable. It’s perfect for individuals, nonprofits, small businesses, and anyone who needs a simple website. Hosting, including a domain URL for a year (you can renew the URL when the year is up). The ability to add meta tags and descriptions to each page. An easy-to-use web content management system, with several customizable templates. Up to 100 email addresses for your domain. A WordPress blog hosted on your domain, should you choose to use it. I’ve used it for years, and I really like it. The one drawback is that your blog does not appear in the navigation when you use the Mac version of the content management system, and I would prefer that option. Check out the websites I have built with Yahoo Small Business and please let me know if I can build an affordable website for you. If you’re reading this blog post today, chances are you are a communicator, like more than half of my clients, or a savvy business owner or nonprofit manager who is into marketing, and wants to learn more. Most of you are on Facebook or Twitter. All of you have important and interesting information to share with the community. Well, I’m not going to get on my soap box this morning and say for the 100th time why you should be blogging. I know — from personal experience and training many people how to blog — that nothing I say in this article is going to push you to blog if you have not already embraced it. So, forget about blogging for a moment. What I AM going to encourage you to do is start commenting on the blogs and online articles you read. Commenting is much easier than blogging, but it can net you almost even better results. Much better results, certainly, than sharing a blog post on Twitter, Facebook, or LinkedIn. Comment here, of course. I would love that. But be a little more strategic about your commenting than The Fletcher Prince Blog. If you are a communicator, you should be actively commenting on any online article you read. 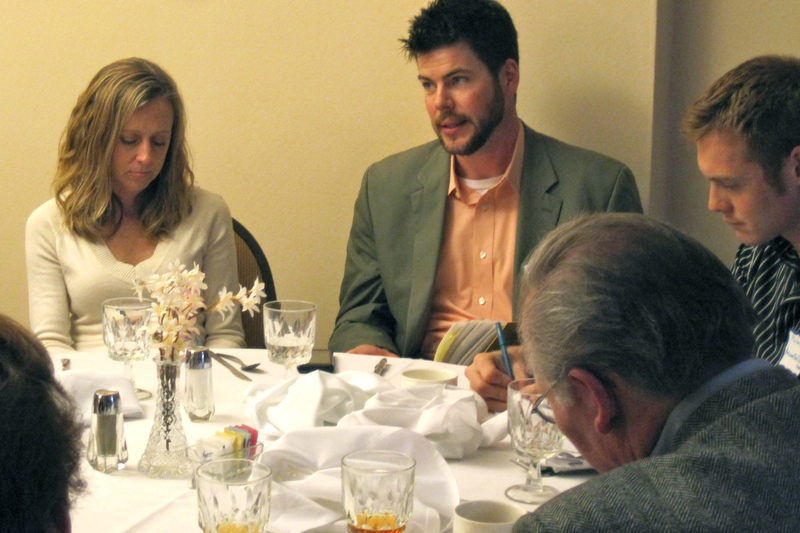 The PRSA-NCC Blog. Waxing Unlyrical. PRSAY. Capitol Communicator. Mopwater PR. Washington Business Journal articles. Social Media Examiner articles. If you work in another field, you should be commenting on your competitors’ blogs, and blogs penned by journalists, industry leaders, and experts connected with local and national associations. Hey, I get why people are reluctant to comment, particularly communicators, who you would think would take to blogging and commenting like ducks to water. In my experience, they’re timid about putting themselves and their ideas out there, for all to see, in perpetuity. Well, let me put it like this. If you’re afraid of making a mistake, it’s time to get over it. You’re making a mistake right now — you’re missing a golden opportunity by not commenting on blogs and online articles. Why? Check back tomorrow. I will give you five incredibly good reasons why you should be taking the time to comment on blog articles. Not many 5-year-olds have to be concerned about their personal brand, but I did. I was appearing in a professional theater production, my first. 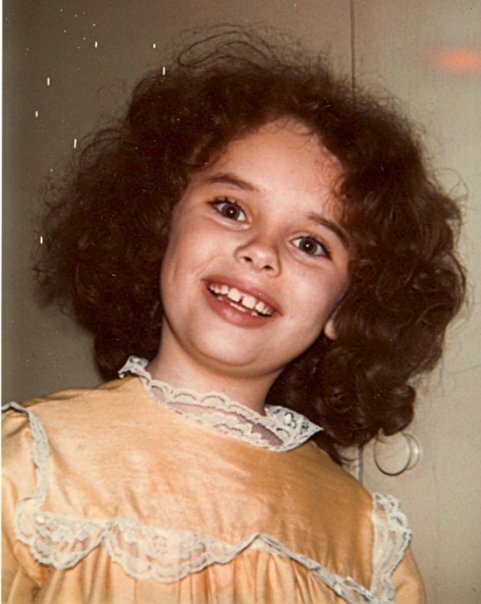 I was the first child in my class to get a regular paycheck. It was time to print the programs, and the stage manager and cast members had a discussion with me about my stage name. It could be my real name, they told me, or a made-up one, but the important thing was to always use the same name in plays in which I would appear, so people would recognize me, and for reviews. We talked about the options — can you imagine having this discussion with a little child? But it really happened — and we all agreed that “Mary Fletcher Jones” had a nice ring to it; much better than “Mary Jones” which was far too generic. So that became my stage name, and the name I used on my school work, and later my resumes, and as my professional name. My name even became an important issue when I married. I married twice, and both husbands were dismayed to learn that I had no plans to change my name to theirs. With a modest career as a writer, as well as many stage productions to my credit, I was not about to change my name to someone else’s. Even in those pre-online days, I understood that changing my name would impact my career. Besides, my name is part of me! I protested. I even made up a little rhyme: My name is Mary Fletcher Jones. It’s part of me. Just like my bones. Well, I hope these two little stories bring home the point that names are important. Yet, even today I encounter communicators who have not fully embraced the power of their own name. Just recently, I was doing a Twitter search on some public relations speakers, and I was surprised to discover that for a few of them, there were no search results for their name. Just as you select a business name, a name you are “doing business as,” you also have to select a professional name, which you will use consistently. To build your professional reputation, particularly online, you must put your name online to build search results. Your “personal brand” name should sound good. Names that sound well when spoken are easy to remember. You may know that names that are comprised of a variety of syllables are considered to be more euphonious. So John Ray Smith is not as euphonious as John Carter Smith. If you had to pick between John Smith and John Carter Smith, you’d probably do well to pick the latter. Your “personal brand” name should be the name you are known as by others, if you have an established reputation. If people know you as Bill Jones, don’t start calling yourself William F. Jones on your online sites. Stick with how you are called, or how you believe people will search for your name online. If possible, your “personal brand” name should not be too long, or too hard to spell. Remember, people are searching for you by your name. Also, it’s hard to pick a username if you have a really long name. Do you really need a hyphenated name? But, hey, some of us are endowed with unusual names. The most critical thing is to make the most of what you have, and to use it with consistency online. 3. A YouTube Channel, with your name URL like this http://www.youtube.com/user/yourname. You should also have one for your company. If you upload any videos in which you appear, be sure to tag your videos with your professional name (contained within quotation marks). 5. 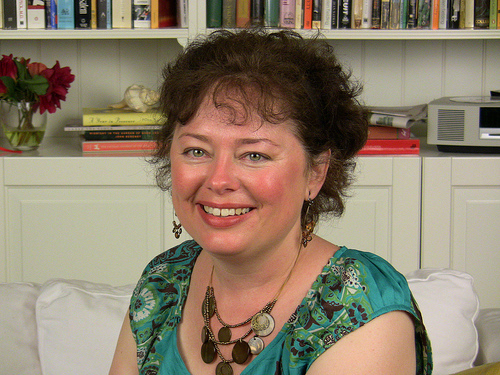 A Twitter Profile, with your real name listed as the user (e.g., Mary Fletcher Jones) and as close an approximation to your real name for the username as possible (e.g., MaryFletchJones). Be sure you also have a Twitter profile with the name of your business. You can link these profiles together, so people will find you on either one. 6. A Flickr account (for which you will need a Yahoo account), with your name as the account name. Do not forget to title and tag your photos of yourself with your professional name, contained in quotation marks, for searchability. And yes, I have a Flickr account for my business, as well. 7. Blog comments. Use your real “professional” name, not an anonymous moniker; not a cute nickname. Blog comments are searchable. Colby Cox, account executive at Marketwire, shared tips for how to construct an effective online newsroom for your organization at yesterday’s IPRA social media roundtable. Don’t just post press releases on your online newsroom. Make it interesting. Add information about your company’s corporate philanthropic work, for example. Divide the page into easy-t0-scan categories (use subheads), such as news releases, annual reports, audio podcasts, high resolution photos, quotations, logos, etc. The page that hosts your online newsroom should look, graphically, like the other pages in your website, to reinforce your brand. Don’t hide your online newsroom in the footer site map. Make it prominent and easy to find. Put it right on your main navigation for your website. Make sure your online newsroom is set up to be viewed on smart phones, iPads, and other devices besides desktop computers. With everything you can do with a blog, are static websites useful anymore? For some companies and nonprofits, the answer is yes. For Fletcher Prince, we use a blog platform for our website. 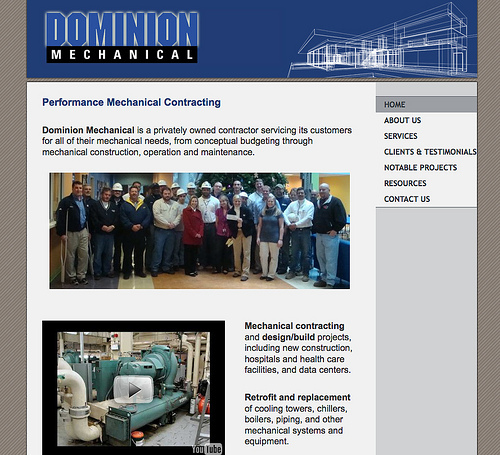 But we have developed websites for clients, and most notably this year, for the Virginia construction company, Dominion Mechanical. The news for websites is that with all the reputable content management systems out there, they have become affordable for companies with the smallest budgets, and much easier to construct and update. Integrating e-commerce features, social media and YouTube video is a snap. Where we add value: creative and affordable website services. These include writing search-engine friendly and engaging content; photo research, editing, and photography; template modification and selection; and website planning and organization. Check out our website services. 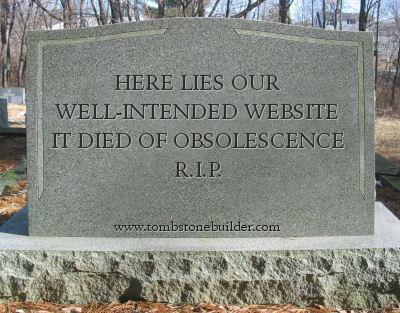 It’s time to kill your website. We just did, and it was so easy! I wish I had done it months ago. My advice: make your blog your website, and focus more energy on your Facebook Page. And keep that blog updated about once a week! Okay, websites are very cool. The design options are better. There is more functionality on websites than is offered on blogs. So, for some businesses, websites are still right (I will continue to offer video-ready, affordable websites as part of my marketing services). I’ll let you all chime in and tell me which kinds of businesses and organizations, in your opinion, still need a website, and why. Just post your thoughts in the comments. But for many of us, blogs are a better solution as our home on the web. Look closely at a lot of websites out there, and you’ll realize they are actually blogs. Because search engines just like blogs better. You can still have a home page, and pages, and tab navigation with a blog (as we do). And you can easily redirect your domain to your blog and have an email address (or a hundred) though a reliable web hosting service. But you now have RSS. And you can easily create 100s of pages (do search engines ever like that) to associate with your URL. If you continue to have a website and it’s the right decision for your company, at least consider adding a blog. I think you’ll be very happy you did, once you see the increase in traffic! Maintaining a robust online presence is critical to creating a favorable impression online, and part of that effort is search engine optimization (SEO). Creating a website that search engines will index for content in search terms relevant to your business, industry, or cause is hard work, but the effort will pay off in increased awareness for your business or nonprofit organization. Even with your best efforts, your website may not appear in the top ranking results for your industry on Google. However, you can influence how terms specifically associated with your business, such as your business name and names of key personnel, appear in search engine results. Here’s how. Google your company name and keywords associated with your industry or website topic. Study how Google currently indexes your website. Are there changes you would make? Make note of these improvements as you makeover your website. Create a reference list of keywords that are important to your industry, or to the topic of your website. Use the free Keyword tool in Google AdWords to discover high frequency search terms. Use these keywords frequently in page titles, body copy, image captions, and video descriptions. But don’t over-use them. You should strive for a keyword density of five to seven percent in body copy. That means that for every one hundred words you write for your website, keywords would occur five to seven times. If appropriate, include your most important keyword in your domain URL. Create a free Google Maps account for your company and a free Google Profile for yourself. Include links to websites and social media in these profiles. Upload the maximum number of images and video to both accounts. A website with plenty of images and video is enjoyable to experience. Alt-tag your images, and use captions for images and video to increase your SEO. Make your website useful to your readers, in way that engages them. You should write content with a particular audience in mind, focusing your content on their needs. Ask yourself, why would the target audience want to read this? What is the benefit of our services or products to these readers? When you write in this way, you will automatically use keywords that search engines will pick up as they crawl your website. Most search engines pick up the first paragraph from your homepage and use that in the description associated with your website URL. Therefore, make sure that the first couple of sentences of this copy clearly and concisely describe the focus of your business or cause. Create a generous number of pages. Search engines give ranking priority to websites that are updated frequently and that have many pages. Short on space? Have a lot to say? Upload PDFs of articles you have written about your business or topic to your website. Search engines will crawl those, too. Create a blog, and add content to it once or twice a week. It should be connected to your website for best results. Blogs are one of the most effective ways to increase the SEO of websites. If you don’t have time to blog (or even if you do), comment on reputable and well-read blogs and online news publications related to your business or topic, listing your website in the comment registration information. The comments will generate SEO-building backlinks to your home page. The more backlinks you create, the higher your website will rise in search engine rankings. Take advantage of social media to create backlinks to your homepage. List your website in the profile section of your YouTube, LinkedIn, Facebook, Twitter, Yelp, and Flickr accounts. Judiciously link to other reputable websites. For example, if your company belongs to a national trade association, it will benefit your SEO to link to their website. 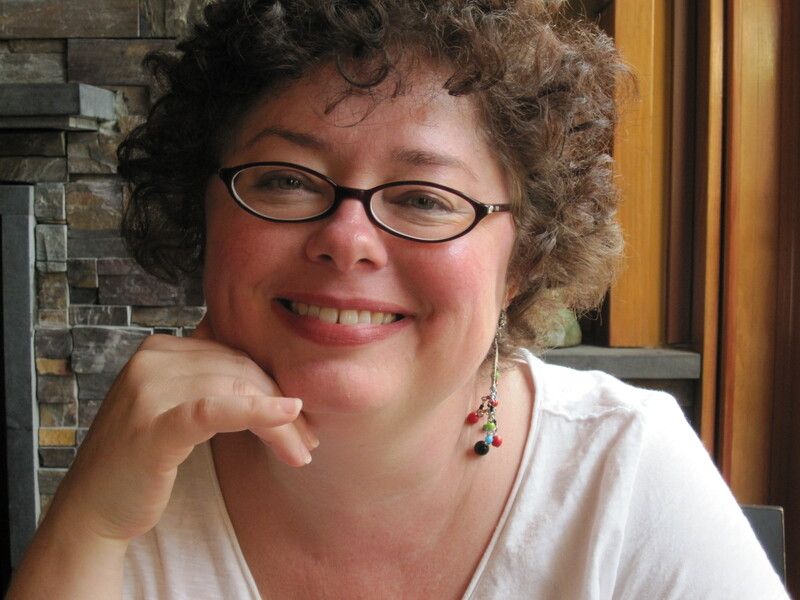 Mary Fletcher Jones is the owner of Fletcher Prince, a Washington, DC communications firm. We live in jaded times. People have become cynical because of the companies and leaders who have lied to them. Advertising is not powerless, but it no longer holds the influential sway it once did. You have to build your case for everything you sell, with complete transparency and with reliance on third-party endorsements. 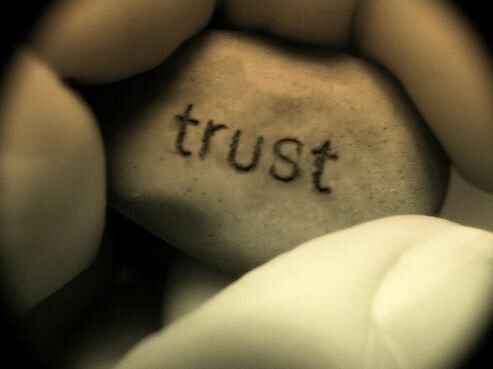 During tough economic times, people are highly discerning about how they spend their money, and will gravitate to brands, products, and organizations they find trustworthy. Having a robust online presence — with images and video they can see, and content and testimonials they can read — is one of the best ways you can earn this trust. As people search for your company online — or keywords associated with your business — they will tend to select the top ranking search engine results, as well as companies and organizations that have many search engine results. Market researchers have also established that people place more confidence in companies that have established a social media presence, including Facebook, Google, YouTube, Twitter, and LinkedIn profiles and accounts. Therefore, taking steps to improve your company’s SEO is another important way to build trust in your business. When you look like you care and are passionate about your business, people will begin to believe in you. Fortunately, you don’t have to spend a lot of money to build online credibility. But it will take planning and effort, and if you are behind the eight ball now, you do need to get started. Here are some sure-fire ways to build credibility in your brand online. 1. Take lots of photographs and post them frequently. You know how they call Missouri the “Show Me” state? In this economy, every state is the “Show Me” state. Your inventory of online photographs must include photos of every staff member, product, and service you offer. I still see websites without photographs. They will not fly. People need to see it to believe it. Post your photographs on Facebook, Google Profiles and Maps, Yelp, and Flickr. 2. Assertively collect testimonials and reviews: Credibility in this economy is everything, and there are few more effective ways to build trust in your company than with testimonials. You need to ask your past and existing clients, customers, and vendors to post testimonials for you on LinkedIn. What lends even more credibility power to the testimonials you re-publish on your website? Photographs and real names of your endorsers and reviewers. Don’t forget, you can also collect video testimonials. Reviews are different. You really should not solicit online reviews, such as those found on Yelp, Google, and TripAdvisor. It violates the terms of service for these platforms. However, you can encourage people to post reviews by establishing a business listing on review sites, including photographs, URL, and contact information. And once you have reviews, you can link to those reviews, including the review icon, which may encourage even more reviews. And you could always ask your repeat customers and regulars for endorsements or video testimonials. 3. Produce YouTube video: 25% of search is processing through YouTube. In search results, people tend to click on links with videos more than those without – even if the video link is ranked lower. And there is no better way to tell your story, or earn trust with your target audience, than to make your case “in person’’ Video is no longer an option; it is a requirement if you are serious about marketing your business or nonprofit organization. Are you worried about production quality? You should strive for a decent level of production quality, yes. You should use a great camera, and proper lighting and microphones. Or, hire a company like Fletcher Prince to produce affordable videos for you. But don’t over think it and delay. Marketers are discovering that consumers actually tend to place slightly more trust in brands that have videos that appear to be inexpensively produced. That is one reason why major brands who can afford to create the best quality video (such as Doritos and Heinz) have relied on consumer productions to promote their brands. It may not pay to be too slick these days. 4. Start blogging: Search engines love blogs; they’re great for driving traffic back to your site. But there are other benefits. Blogs are an effective way to present your subject matter expertise, which builds trust in you and your business. They can be easily linked, shared, and fed into your social media platforms, and other people can easily share your posts on their sites. Not every blogger is lucky to receive many useful comments, but when you do receive feedback, you may find it useful. One blogging bonus — that you don’t often hear people talking about — is that the action of formulating and shaping your thoughts into text and images, and the discipline of routinely blogging about your services, industry, and issues, will help you constantly examine and refine how you present yourself and your business. It’s just a great mental workout, which is why I recommend it for everyone. My experience with blogging is that it has helped me become more articulate and confident in client meetings, and as a speaker. 5. Comment on popular blogs and online news articles: Search engines rely on the number of inbound links you have to your website to determine if your web site is popular and reputable enough to bump to the top pages of search engine rankings. There is are two very easy and legitimate ways to create inbound links. First, link to your web site from all of your social media, YouTube videos, blog posts. Secondly, whenever you comment on blogs and online news articles about your industry, you usually have to add your name, email, and website URL. Each of those comments will link back to your site as an inbound link, and will boost your rankings. So, it pays to express your opinion, especially on popular blogs. Don’t believe it? I just checked my Google search engine results for blog posts for the name of my company. Between my blog posts and comments, there are more than 76,000 search engine results. Do you think I could have bought that kind of exposure? I couldn’t. It’s all from blogging and commenting. 6. Update your web site. Your web site will usually be in the top search engine results for your company name, and if you’re fortunate and strategic, for your industry. More than 80% of web users click on the first listings. The kinds of changes you should be making now? Featuring your social media links, revising copy to contain keywords (words and phrases an organization’s customers are searching for online), and adding video, photographs, and PDF files. Now, if you’re reading this and thinking, “Sure, Mary, but easier said than done,” then you need to talk to me about creating an actionable online marketing plan for your business. That IS what we do at Fletcher Prince. You can trust that we know what we’re talking about, because we have 22 recommendations on LinkedIn and 2 video testimonials on YouTube. Now, that’s what I’m talking about! If we can do it, so can you. Visit http://www.fletcherprince.com to learn more.